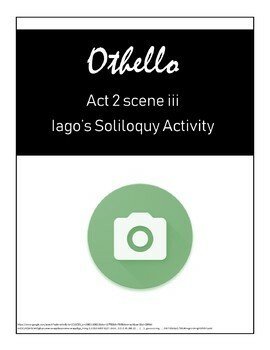 A soliloquy activity that uses both a worksheet and a computer - students will pick a villain from another movie or book and write a soliloquy from that villain's point-of-view that mimics the structure of Iago's soliloquy. After writing the soliloquy, students will record it on an online video recording website. This assignment requires students to use a computer or a Chromebook. If you cannot get a class set of technology, this lesson is not for you.